This one has a lot of progress images! 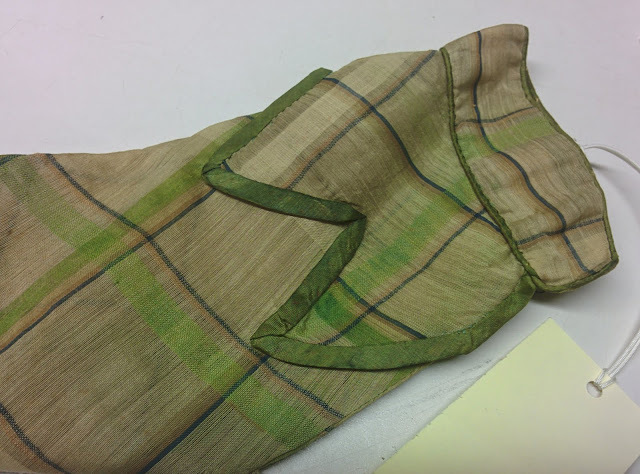 When I cut out the sleeves, I figured that because the pattern (Regency Women's Dress, p.98) appeared to fit me at the wrist, I could just cut out the sleeve exactly as drawn. Not so! I sewed the seam on one and it was far too tight in the forearm, so I pieced in a tapered strip under the arm, which I did not bother to match as it cannot be seen. The next step after that was to hem the part of the seam left open near the wrist and pin the trim into place - note that the trim pieces are not symmetrical and must be matched with the proper sleeve. The cuffs were then piped all the way around, and sewn down on one long and two short sides. The remaining side was put right-side-to-right-side over the trim and end of the sleeve and sewn down through all layers. The corners were snipped to allow the allowances to be turned in. Then I turned to the armscyes. These needed to be cut into, mostly in front, to be big enough for my arms, and then the piping was basted on. The ends of the piping don't have to be handled too neatly, since they're completely hidden under the trim at the neckline. The sleeve was pleated to fit, not very precisely, with the pleats pointing backward, and sewn in with a spaced backstitch. One of the last steps was to sew the lining into the neckband and cuffs. This is counterintuitive to the modern seamstress, but while it requires more steps, it also makes it easier to handle so many layers coming together. Both the cuff and neckband linings are rectangles - while the neckband is made of smaller, overlapping pieces, the lining is just one long piece. Sewing in the hooks at wrist, neckline, and waistband was the actual last step. (I haven't yet put eyes on; I'm very bad about that. Right now small safety pins are filling in.) As you can see above, even with the piecing in the seam, the sleeve is fairly tight. Now for the event photos! 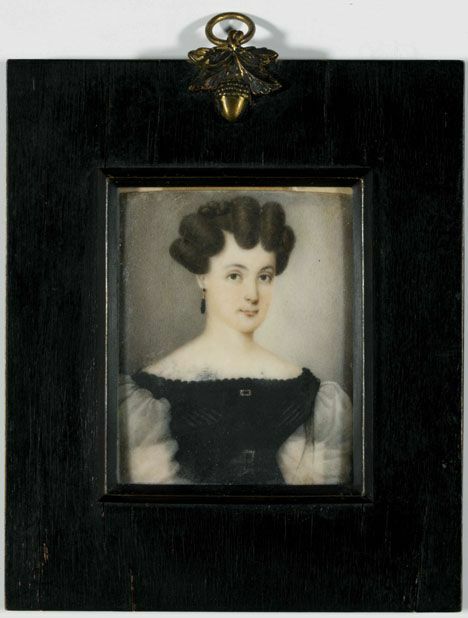 I've always been hesitant about trying to do historical hairstyles because I have a mental block: I know that I Can't Do Hair, so I only try half-heartedly and then it looks terrible. But I had my hair cut into a middy in March, and got very used to doing pin curls, so it was not a big deal to do some in the front. The back I put up in a high ponytail and was just able to twist that around into a bun and pin it in place. In my Hartfields, on the steps of the museum! So, what did I learn from this that might help you if you want to use this pattern yourself? The proper underpinnings are very key. This is true in all periods of historical recreation, but it's especially true of 1800-1830. I'm using an old Regency "wearable mockup" corset that doesn't fit quite right and you can tell in the picture right above. With the waistband drawing the eye, a slightly-too-low bust looks even lower. The bodice length is also key. That doesn't exactly set the pattern apart from many others, but because it's cut with a waved lower edge - being longer below each breast than it is in the middle - you really have to think about the proportions more. Increase the armscye from the top. That is, don't cut into the side of the front, but make sure that the bodice is cut high enough at the sides to fit around your arm. If you have a larger arm, make it several inches higher than the original. 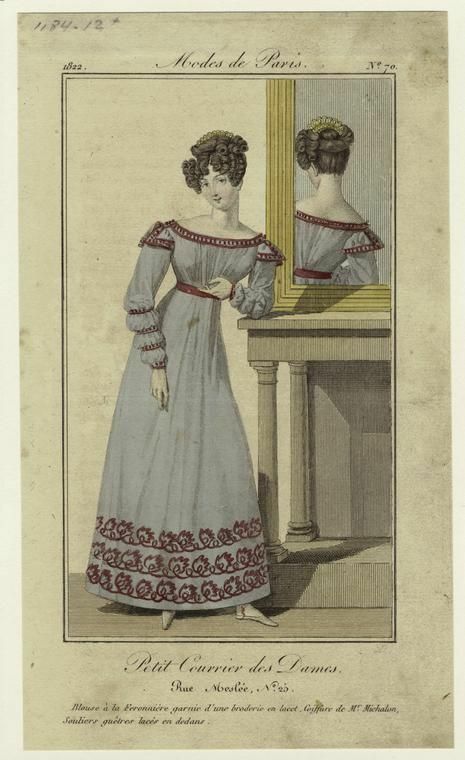 In the 1810s and 1820s, the effect for the shoulders should be wide. The armscye should be out on the point of your shoulder and on the side of the bodice. That's it for now! I plan to take out the sleeves and repleat them (too much fabric ended up in front) and to make that flat, piped flounce ... but not for a while, as a new project is now on my plate. I hope this was helpful and interesting! If you enjoyed it, please consider checking out my Patreon page. You look great! I love how it turned out! Squee! It's so adorable! 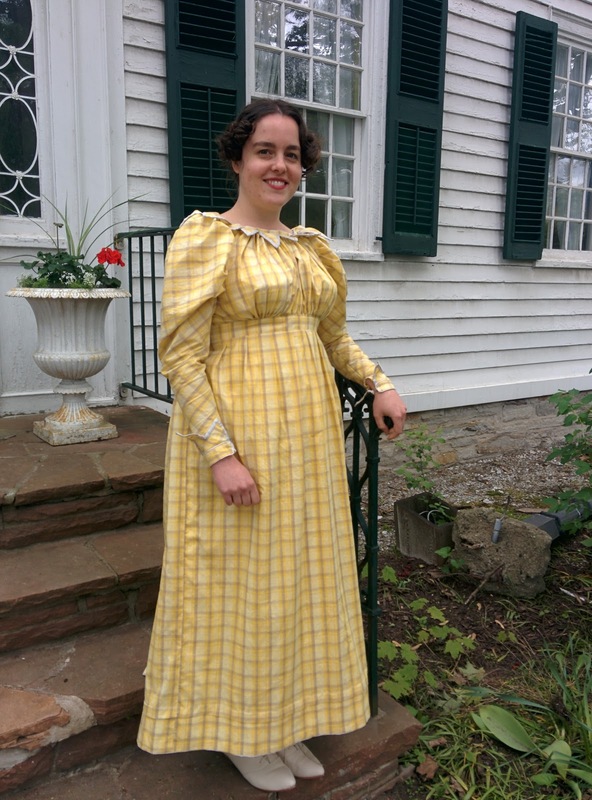 I love the fun, light yellow, and all the vandykes look amazing! This is gorgeous! I think the cuffs are my favourite. Also the Madras check is a lovely colour!